Pipe insulation provides the same benefits for hot water lines connected to a tankless water heater as it would if it were connected to an indirect water heater. Even if you have an efficient water heater in your home, you could still be losing money without the proper insulation. Pipe insulation ensures that you don't have "standby heat loss", which happens when you lose heat while your system isn't actively being used. Dr. Energy Saver can provide you with complete pipe insulation to ensure your hot water system is as efficient as possible. Call us today to get started with an evaluation and estimate! This video explains how your home's pipes can waste energy and why it is important to insulate both hot water and cold water pipes. Although modern tank-type water heaters come standard with insulation, this is not the case for hot water plumbing pipes that carry heated water to faucets, dishwashers, showerheads, and washing machines. Without proper insulation, hot water pipes are left unprotected from the cold ambient temperatures in a basement or crawl space. As a result, the hot water in the pipes cool off, making you wait longer for hot water when you need it. Pipe insulation reduces overall standby heat loss, so that your hot water gets to the tap, showerhead or appliance sooner. Homeowners appreciate the convenience of hot water that arrives faster. But it's also important to note that pipe insulation offers more than convenience. It also offers two kinds of savings: energy and water. As home energy performance experts always say: "Every little bit helps." Installing pipe insulation on your hot water pipes is one of those "little" improvements that you will appreciate for as long as you own your home. Our experienced technicians will thoroughly evaluate your pipes, and then determine what size and type of pipe insulation to use to give you the best results. 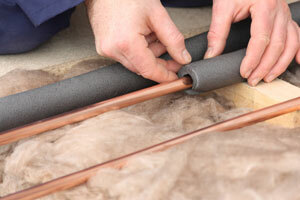 If you're interested in pipe insulation for your home, contact your local Dr. Energy Saver dealer today! We can help you get the insulation solutions you need to ensure your home is as energy efficient as possible.